Blogger is a service provided by Google and is completely free. It is easy and simple to use and if you already have a Google account you ll set up your blog in minutes. Kidblog is designed for K-12 teachers who want to provide each student with an individual blog. Students publish posts and participate in academic discussions. Crowdsource feedback on learning activities and use this input to inform your future instructional strategies. Backchanneling empowers students voice and make them feel they are real participants in the knowledge building taking place in the class. Assess students prior knowledge about a given topic. Brainstorm ideas for a writing project. Encourage students to ask questions about anything they did not understand. Organize real time discussions in class. Backchanneling is a good way to engage introverts and shy students in classroom conversations. Kahoot allows teachers to create quizzes and surreys that include a wide variety of multimedia elements such as videos, pictures and text. Each quiz you create can be accessed by students across different devices . Zoho Survey is a great tool that teachers can use to create surveys and quizzes. This service comes with a wide variety of interesting features such as: Mix and match 21 response formats in your survey, ready made templates and themes to use with your surveys, multiple question types are available and hence you can ask your audience exactly what you want. Add logic to your surveys by skipping or adding questions. Depending on the survey taker’s previous responses, you can always make the surveys shorter and more relevant. Poll Everywhere is a powerful web tool for creating and distributing polls. It offers you five types of polls to choose from: multiple choice poll, free response poll, true or false poll, clickable images poll, and discourse poll. Your respondents can vote on your poll either through SMS or via the web using the generated link you will provide them. Poll Everywhere also has a wonderful way of displaying the results of the poll. 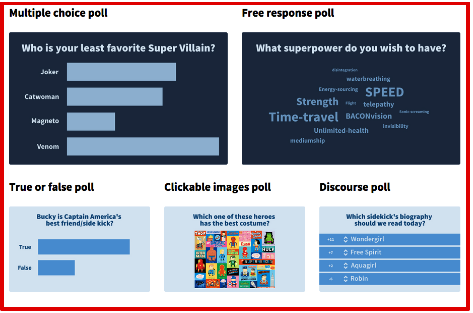 You can have the results displayed on a chart of bouncing bars.You can also present your polls as a seamless part of your PowerPoint or Keynote slideshow. Flip on through and instead of another flat picture, your respondents see your slide come alive with real time poll results. Popplet is a free online tool that allows you to create mind mapping and brainstorming diagrams. You may create a maximum of 5 Popplets. MindMeister allows your to be more innovative by providing a shared collaboration and brainstorming environment on the web. Plan projects, manage meetings and sketch out business plans online with partners and colleagues, all in real time! Lucidchart is a web-based diagramming software which allows users to collaborate and work together in real time to create flowcharts, organisational charts, and mind maps. Bubbl.us is a simple and free web application that lets you brainstorm online. You can create colourful mind maps online, share and work with friends,embed your mind map in your blog or website, email and print your mind map, save your mind map as an image.